According to the United Nations, Canada and Australia receive the most immigrants per capita in any given year. Learn about the Canadian immigration process, eligibility and special programs for different Canadian Provinces. Every year, over 200,000 people are allowed to enter Canada as permanent residents. They complete an application process that provides them with an opportunity for a new life in Canada. Once approved to enter Canada as a permanent resident, an individual receives a Permanent Resident Card (formerly Landed Immigrant form) and enjoy almost all the same rights as citizens of Canada (with the exception of voting privileges and unlimited stays when traveling outside of Canada). The process of obtaining permanent residency in Canada is complex and time consuming. It is also in a state of constant change due to different foreign policy initiatives and modifications to regulations. Individuals can apply to become permanent residents in Canada under the skilled worker class. Applicants are evaluated based on education level, language ability, work experience, age, arranged employment and adaptability. Each factor is individually evaluated and the overall score determines whether the applicant is a suitable candidate for permanent resident status. The combined score is from 0 to 100, with the minimum qualifying level set at 67. This is not the only measure used to determine candidate suitability. Citizenship and Immigration Canada also takes into account an individual’s criminal history (if one exists), the Canadian labour market and other factors to determine the outcome of the application. However, this score is a good starting point to determine whether you can apply for the permanent resident status under this category. For example: a 25 year-old female with excellent English ability, basic French knowledge, a Master’s degree with 2 years work experience in the country of origin, no prearranged employment in Canada and a spouse that has studied, lived and worked in Canada might score upwards of 80 points overall. This combined score of the six factors would make her eligible to apply for permanent residency. However, different individuals score differently and this example is in no way representative of the larger population. There are classes of individuals In the Business Class category that qualify for permanent residence: investors, entrepreneurs and self-employed persons. Investors are required to demonstrate business experience, a legally obtained net worth of C$800,000 and to invest C$400,000 in Canadian economy. There are also additional requirements. Entrepreneurs are also required to demonstrate business experience in owning and managing businesses or in owning a share or percentage of an enterprise. They must also have a net worth of C$300,000, be willing to manage and operate a business and create at least one full time job (not including his/hers) within three years of becoming a permanent resident. Self-employed persons are must have the experience, intention and ability to establish a business that will, at a minimum, create an employment opportunity for themselves and that will make a significant contribution to cultural activities or athletics in Canada; or purchase and manage a farm. If you have a specific province in mind that you would like to immigrate and settle in, this process allows a province to nominate individuals that they wish to include in their selection for immigration and settlement. This process requires the individual to contact the representative immigration office within the target province and apply for nomination to that province. After this nomination has been performed, the individual has to apply to the Citizenship and Immigration Canada. If you have any members of the close family that are permanent residents in Canada, they may be able to help you obtain permanent residency. Approximately 30% of all immigrants that come to Canada are sponsored by family members. Individuals living in Canada are obliged by the government to sponsor family members coming to Canada for a period of 3 to 10 years in order to help them settle in Canada. Canadian permanent residents are permitted to adopt children from foreign countries. The process is quite long and arduous in order to protect the rights of children and it involves conducting various studies of the adoptive family and its surroundings. Adopting a child from another country involves different legal issues and entities such as the Provincial immigration office, Hague Convention that governs international adoptions, child’s country of origin legal offices and so on. Canadian families intending to adopt children have to be able to sponsor them for extended period, and be committed to raising the child and pursuing his or hers best interests. Note: Fees assessed for principal applicants and family members under the Family Class are payable, along with the sponsorship fee, when the sponsor files the sponsorship application. The above fees are in Canadian Dollars and are subject to change at the discretion of Citizenship and Immigration Canada. 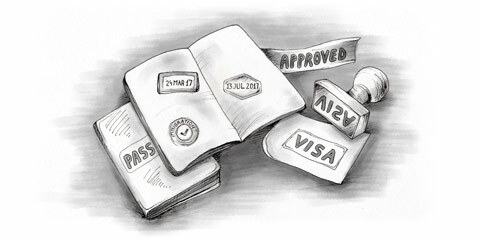 Getting started: Who needs a Visitor Visa? And how do you apply for it? Tourist & Transit Visas: Will your visit qualify as tourism or transit?